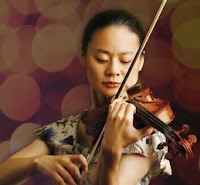 Midori (Midori Goto) is a Japanese (some would say American) violinist, teacher, and writer, born on October 25, 1971 (Perlman was 25 years old.) She began violin lessons with her mother at age three. Her first public performance took place at age seven. After she and her mother came to the U.S. (1982), she began studying at Juilliard with Dorothy Delay. Her New York debut took place with the New York Philharmonic under Zubin Mehta that same year. She has been concertizing ever since. YouTube features a popular home video of her performance at Tanglewood (1986) when her E string broke twice while she played. In 2000, she graduated from New York University, having earned a Bachelor’s degree in Psychology and again in 2005 a Master’s Degree in the same field from the same school. Nowadays, Midori spends a lot of time teaching - she has founded several educational programs for children. She has also taught at USC (Los Angeles - Heifetz used to teach there) and the Manhattan School of Music, among other schools, and is the recipient of several prestigious awards. However, her discography is not extensive and she has yet to record (or release) the Beethoven and the Brahms concertos, two war horses of the violin repertory. She wrote a memoir (Simply Midori) which was published in 2004. She has played (and perhaps still plays) the famous 1734 Huberman Guarnerius. A wonderful CD and DVD of her Carnegie Hall recital (1990) are still available. Here is a sample from the DVD posted on YouTube.